Woodlice have a shell-like exoskeleton, as they grow in size they must shed their old shells. Additional information about the Woodlouse Insect picture : Woodlice are not an insect, for a start they have fourteen legs rather than seven. 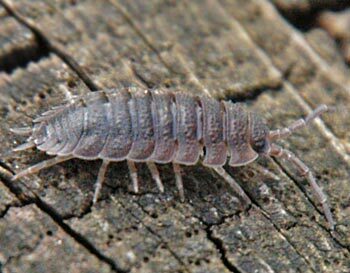 Their are over 3000 known species of Woodlice but only 37 are native to the UK. Siteseen Ltd. are the sole copyright holders of this Woodlouse Insect picture, unless otherwise stated. We only authorise non-commercial picture use and particularly encourage their use for educational purposes. This Woodlouse Insect picture is not in the Public Domain. 1) www.educationalresource.info must be credited as the copyright holders wherever this Woodlouse picture is used. 3) Use of this Woodlouse Insect picture, or any of our pictures on websites re-distributing copyright free material is strictly prohibited.